Nearly everyone in central and southern Mexico enjoys pan de muerto—translated literally as "bread of the dead"—in early November as an important element of the annual Day of the Dead celebration. Most family and communal ofrendas (offerings for the beloved deceased) include at least one loaf left for the enjoyment of visiting souls. Many varieties of pan de muerto exist, with their shape, texture, and flavor particular to one or more geographical and cultural regions in Mexico. This recipe, common in Mexico City, yields a sweet, semi-spherical loaf decorated with pieces of dough in shapes that represent bones and tears. 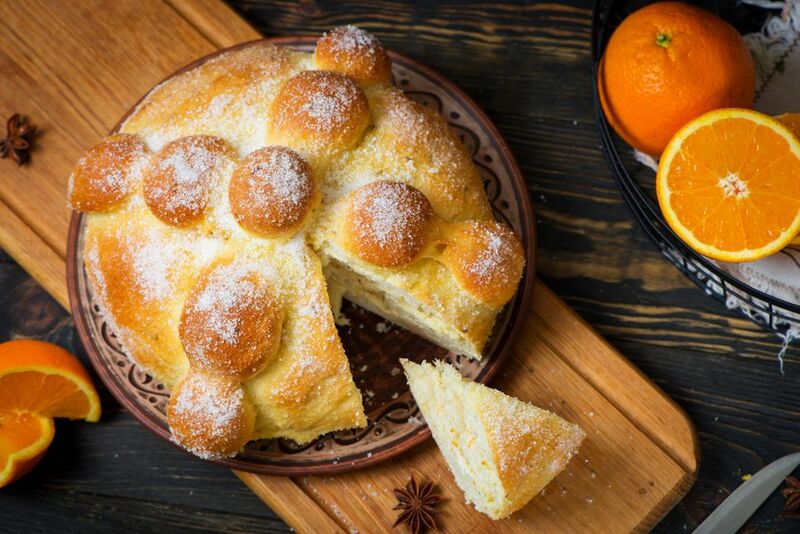 Nowadays, many Mexicans buy pan de muerto from a bakery, but you can help keep the delicious tradition of homemade pan de muerto alive with this recipe. In the bowl of a stand mixer, combine butter, sugar, aniseed, salt, and 1/2 cup of the flour. Use the dough hook to mix the ingredients until they begin to come together. In a separate small bowl, whisk together the eggs, water, and orange zest. Add this to the stand mixer bowl, along with another 1/2 cup of the flour. Mix until combined. Add the yeast and another 1/2 cup of flour, mixing to combine. Add the remaining flour 1 cup at a time, mixing between additions, until a dough forms. Turn the dough out onto a floured surface and knead it for 1 minute. Cover it with a clean, damp dishcloth and let rise in a warm area for 1 hour and 30 minutes. Separate about 1/4 of the dough and use it to make bone shapes to drape across the loaf. Shape the rest of the dough into a flat-bottomed semi-sphere. Position the bone shapes on the top of the loaf and press gently so they adhere. Let the dough rise for an additional hour. Bake the loaf in a 350 F oven for about 40 minutes (30 minutes for smaller loaves). Cool and glaze, if desired, before serving. Cut pan de muerto into large wedges for eating by hand. Serve it with Mexican hot chocolate or champurrado (chocolate atole) if you like. Note: The most common bone-shaped dough pieces look stylized yet still simple. You might just form ball shapes and press them into the loaf in a line. You also can take a piece of dough, roll it into a long cylinder and place a ball at each end. You can add more detail if you like, but even a slightly "knobby" loaf gets the idea across. Choose one of these glazes to finish your pan de muerto. After applying a glaze, sprinkle the loaf with plenty of white or colored sugar using granulated table sugar, superfine (not confectioners') sugar, or table sugar pulverized in a blender or food processor. Orange Juice Glaze: Bring 3/4 cup sugar and 1/2 cup fresh orange juice to a brief boil, then cool to room temperature. Brush it on the bread after the loaf cools. Orange Juice-Egg White Glaze: Mix 3 tablespoons thawed orange juice concentrate and 1/3 cup sugar with 2 large egg whites. Brush it on the bread during the last 10 minutes of baking. Brown Sugar-Cranberry Juice Glaze: Bring 1/4 cup piloncillo (or dark-brown sugar), 1/4 cup white sugar, 2/3 cup cranberry juice, and 2 tablespoons orange zest to a boil, then let it cool to room temperature. Brush it on a baked loaf after the bread cools.